Adventurous spirits, questioning minds, and compassionate hearts will find a home at United Campus Ministry and together we can build an amazing community that can make a difference in our life, our campus, and the world around us. We welcome all conversation partners to explore faith and life issues together. The more variety the better the conversation and exploration can be. We seek to understand spiritual realities and guidelines to live life with integrity. T﻿hrough days of exhausting schedules, multiple responsibilities, and critical decisions many persons are looking for a place of quiet rest, a setting for worship that will refill and revitalize. 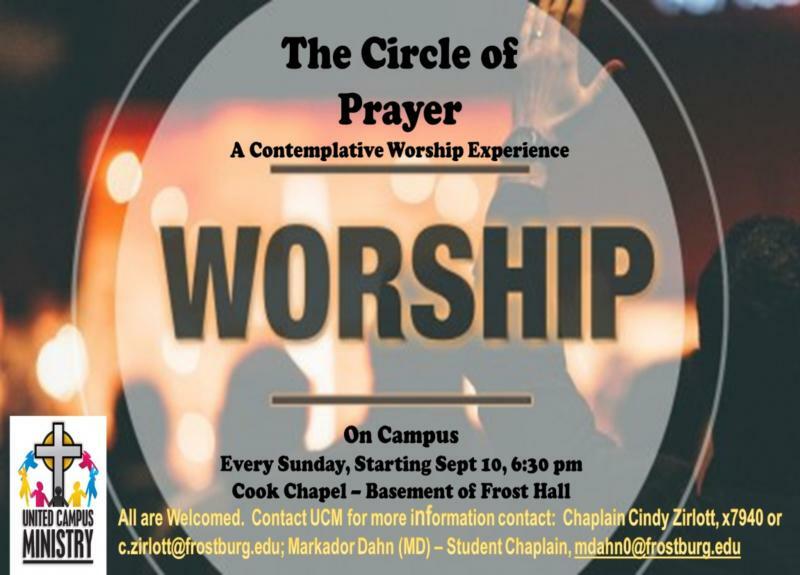 The Circle of Prayer is designed to help us find spiritual refreshment through conversations with God in a reflective and meditative way.﻿ Workshop or Instruction with a focus on prayer is offered. 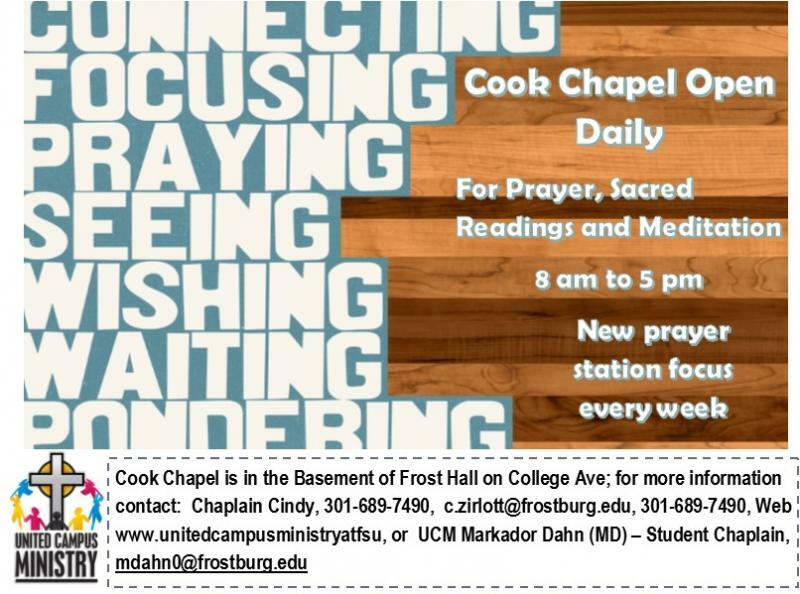 Cook Chapel is locate off College Avenue, in the basement of Frost Hall. Parking nearby in the Campus Police lot. This contemplative worship setting focused on prayers helps to quiet our spirits in order to open our souls to hear the voice of God with our hearts. Our Prayer Stations are designed to help you have that quiet time conversation with God. 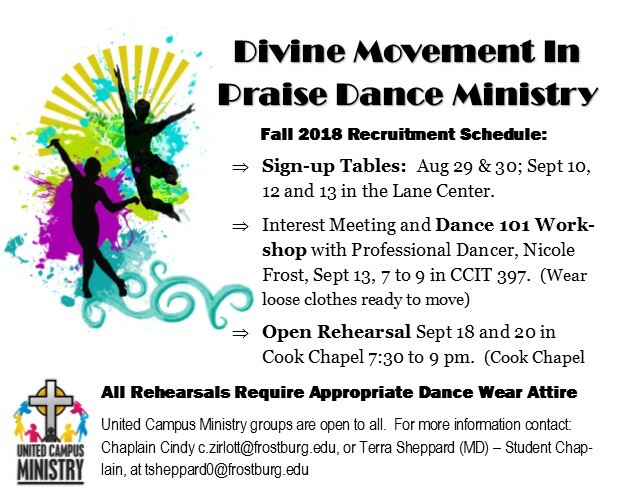 A weekly worship experience starting Sunday, September 9 in Cook Chapel. Cook Chapel is locate on College Avenue, in the basement of Frost Hall. Parking nearby in the Campus Police lot. 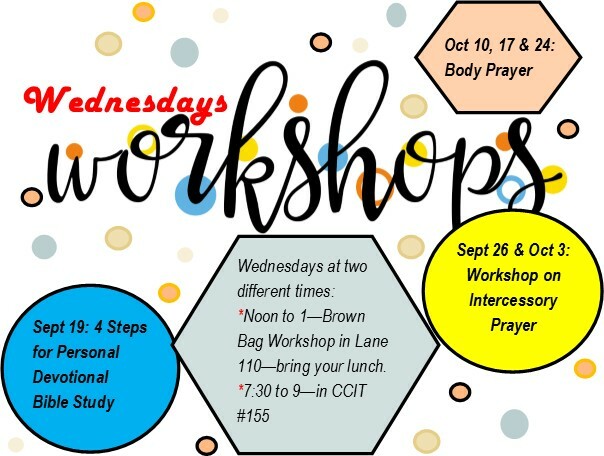 Various forms of prayers and guided meditation time with new prayer stations each week, time for intercessory prayers and share answered prayers too. Free Devotional guides are also available. 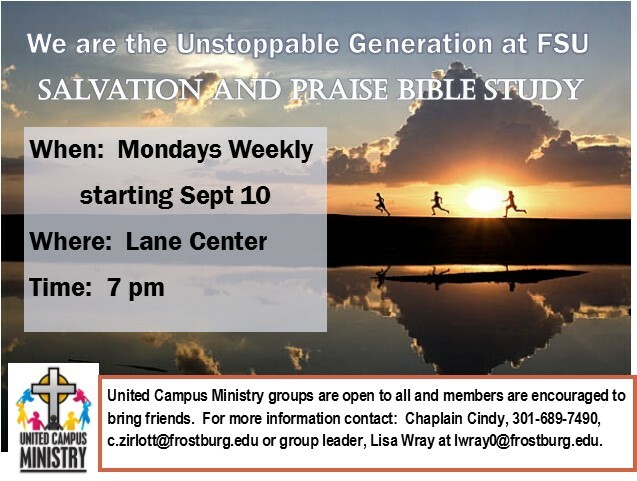 Mondays we have Salvation and Praise Bible Study Group meeting in the Lane Center at 7 pm. Salvation and Praise is a student lead ministry dedicated to serving the college community of FSU each week with intimate, life-changing encounters and fellowship with God. Leader Myia Smith says, "We are not focused on religion but relationship! Isaiah 60:18" This year our students leaders are Myla Smith and Rebecca Ojomu. Everyone needs direction in life. United Through Christ Bible Fellowship is about finding our way in a lost world. Let's face it, this world has its share of problems and pain that may from time to time over-whelm us. But Jesus Proclaims that God's intention for us is abunance of life. He said "I have come that they may have life, and have it to the full". If you are weary of just muddling through life; if you long for deeper meaningful conversations; if you want to know the wonderful plans God has for your life and future, join Bible Study Fellowship! 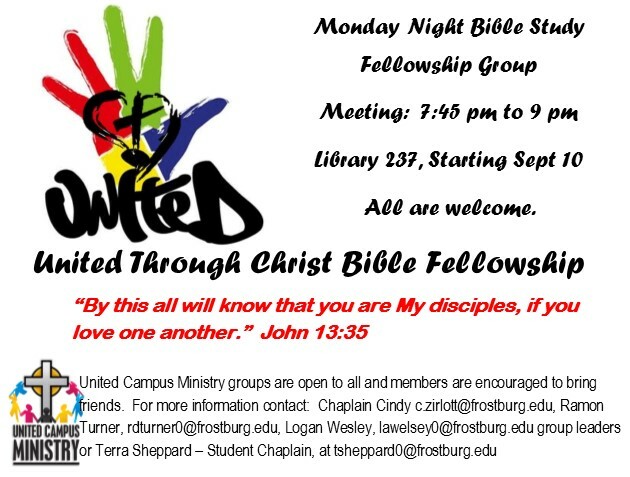 United Through Christ Fellowship is a gathering of FSU students and other young adults in the Frostburg area who come together for conversational encounters seeking activities focused on helping us all become deeper disciples and folllowers of Christ. 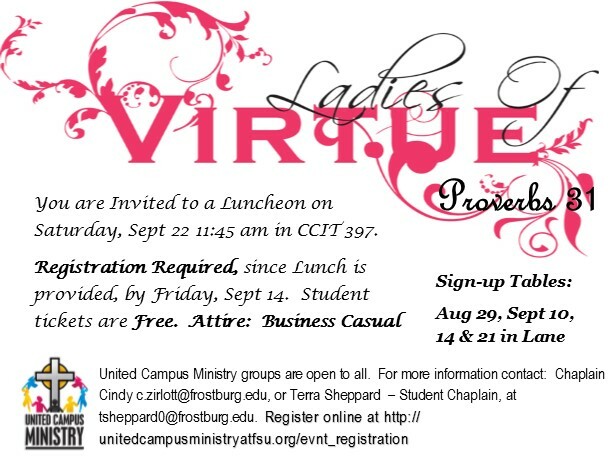 The mission of Ladies of Virtue group is to promote empowerment in women to build positive Christian leadership by following Christ. This group’s goals are to meet weekly, to have bible studies and devotions, to have community women leaders to speak and develop mentor relationship, to be involved in community service, and outing opportunities. Normal Weekly Meetings will be Thursdays. Starting Sept 27, in CCIT 156, 7 to 8:30 pm. · Noon to 1—Brown Bag Workshop in Lane 110—bring your lunch. This are hands on learning experiences to help you grow in spiritual skills, leadership skills, and spiritual maturity. Starting Sept 19. Lead team will develop new topics based on your interest as the semester continues.